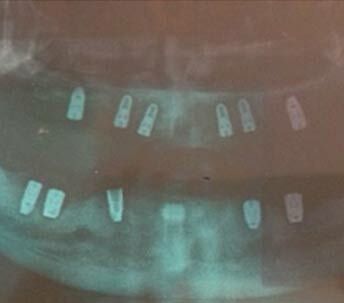 IMPLANT CASE BLOGS As most patients hear of the word “Implant”; we have often seen them give incredulous looks … one can palpate the apprehension and uncertainty … the indecision in their minds… the innumerable questions that sometimes stay unasked as they feel they are being impolite by questioning too much and those other times when the consultations just don’t end…!!! This patient had come down from Kolkata especially for dental treatment with loose mobile front teeth and some decay in his back teeth. On examination, it was noticed that few teeth required Root canal and few required capping while the lower teeth were too mobile to be saved. 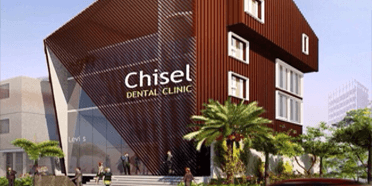 Hence, accordingly the treatment was scheduled such that on one day itself the root canals were completed and measurement was taken for crowns for the back teeth and then the lower front teeth were removed. Since there was no infection in the area, soon after removal, immediate placement of 2 implants was done to replace the 4 missing teeth under the same anesthesia. The next day, as the patient was feeling comfortable, temporization was done for the front teeth and the posterior crowns were also fixed. The third day, after the follow up checkup, he left the same evening. 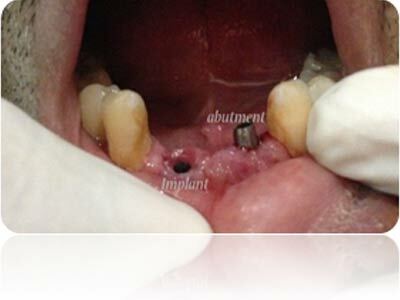 After 5 months, he mailed us the latest OPG, showing stabilization of the implant. A local check up there confirmed he was ready for loading of the implants (crown placement) post which he scheduled his second visit. 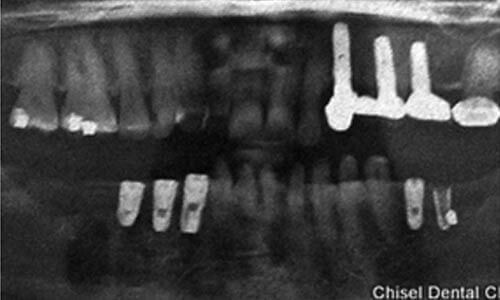 On the first day of his second visit, the abutments (the top portion of implant resembling the prepared tooth) was fixed and impression taken and sent to the lab. 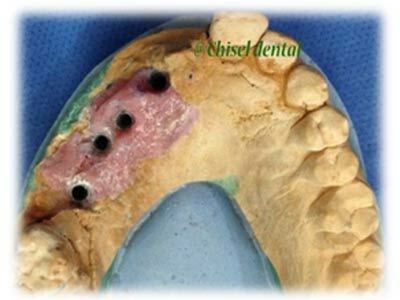 The next day, a fitting trial of the fixed prosthesis was done and it was planned to add gum ceramic to the front two teeth to replace the missing gum height and after the trial on the fourth day the prosthesis was cemented onto the Implant abutments. 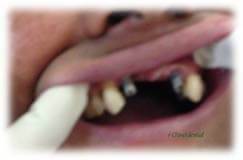 This young patient had lost his front four teeth and was looking for alternatives. 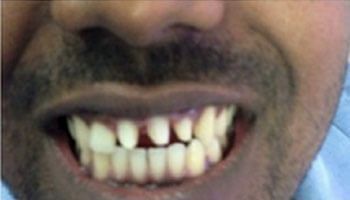 Since he had already lost these front teeth he did not wish to touch any of his other normal teeth and made a conscious decision of going in for implants. 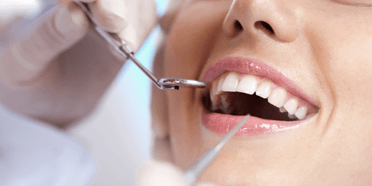 Firstly, impression was taken for temporary crowns and a through gum cleaning was done as it was required. Two implants (one on either side) were placed, the whole procedure completed in less than 30 minutes, supervised by taking digital x-rays. The third day, checkup was done and removable prosthesis was given for the interim period. After a 6 month recall x ray, the abutment was placed and final prosthesis was fabricated within 4 days for Implant supported Zirconia Bridge. When all the back molars on one side are missing, a minimum of two implants are sufficient to replace all the teeth on that side. 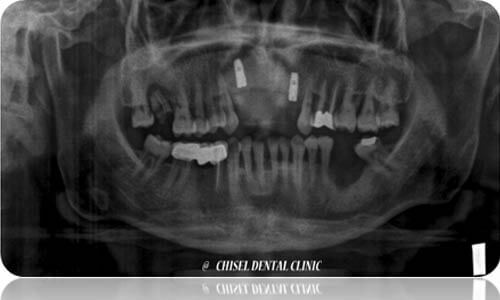 The procedure and duration remains the same as in the above cases if the replacement is planned for immediately and implants can be placed immediately soon after extraction of the concerned teeth as with the upper right side of the following patient. Now-a- days, with the advancement of Digital RVG x-rays, constant chair side evaluation of implant placement has eliminated the earlier so called mishaps or complications of implant placement. 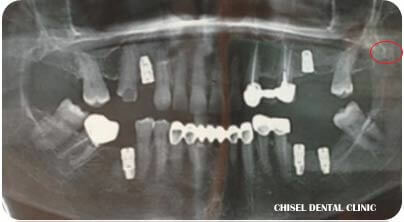 This patient had lost her behind teeth 5 yrs. ago and once she lost the other side too it set her looking for replacements. She could not go in for bridge as there was no last tooth. On her consultation, her opg x ray showed reduced bone height in upper region and that the sinus had occupied that space. Hence a specialized 3D x-ray called CBCT was taken to check the exact height and width of bone for the treatment planning. Then implant was placed in the other regions and in upper implant was placed following Sinus lift procedure along with bone graft mixed with PRF [Platelet rich fibrin] derived from the patient herself. Sutures were placed and pt. was recalled after 5 days for check-up. After a week, the sutures were removed and the area was allowed to heal. First follow up opg after 5 months showed that some more healing time was required for upper region and the lower showed appropriate stability. 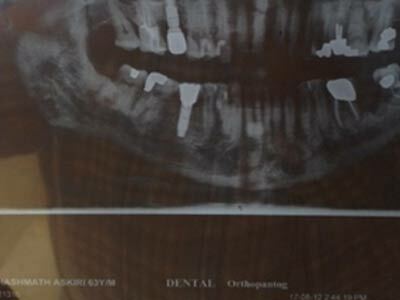 The prosthesis for the other teeth were fabricated by the end of 6 months while after 8 months the x-ray revealed that the implant had stabilized and fixed prosthesis was given for the upper. 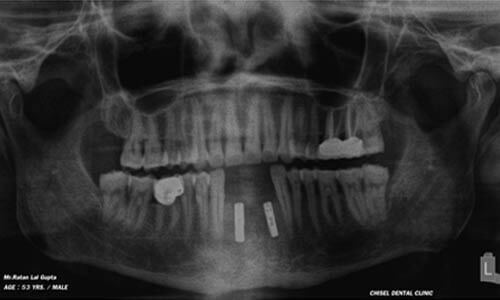 This 68yr old patient had her lower jaw completely inside, shrunken, and not in line with the upper arch. Few years ago, implants were completed for the upper and now she wanted to replace her lower back teeth also with implants... 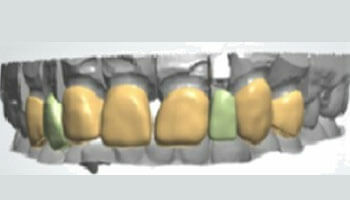 Though the implant procedure remained the same, in the planning stage itself, implants were placed in the area of strongest /ideal bone presence and the implant placement was designed to allow for angulated abutments that would ensure crowns could be placed in function with the upper teeth. 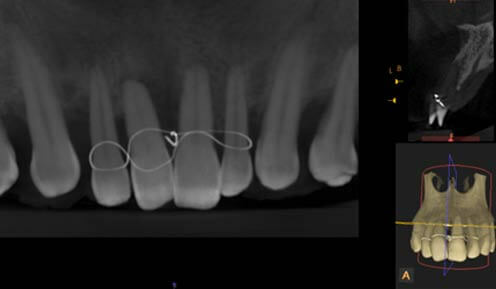 Whenever all of the teeth are missing as in this case… treatment planning is essential with a complete discussion as to the patient’s expectations. 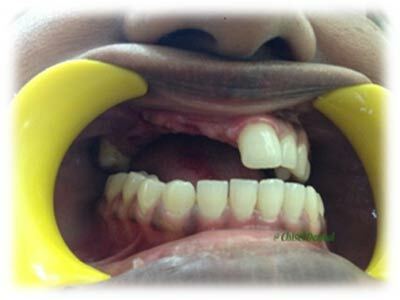 In this case patient was tired of her loose removable complete dentures and wanted good functionality most importantly in terms of chewing and equally important was that it be cost-effective. Hence for her, the treatment plan arrived at; constituted placement of 4 implants on the upper to ensure a fixed hybrid denture which not being as heavy as a bridge does not require greater no. of implants but has really good ceramic esthetics and functionality with less coverage of tissue than a denture and for the lower only 2 implants were placed and a ball and socket type of semi-fixed denture was planned that was economical with acceptable esthetics and function. All the implants were placed on the same day itself and a regular removable complete denture was fabricated as a temporary/interim denture for the healing period. 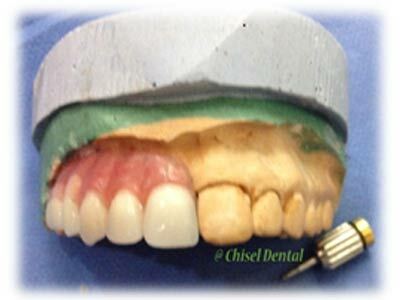 After a period of 6 months the process of fabricating hybrid denture was initiated for the upper and for the lower jaw ball and socket type denture was fabricated. Also in her case the teeth were customized to look older and slightly worn out as she wished it to match with her age and appearance. 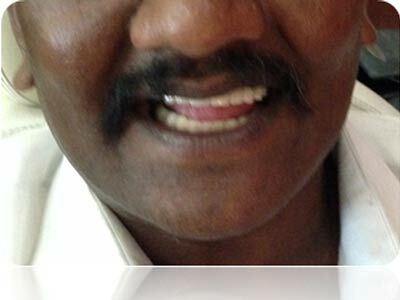 Whenever a young person loses all his teeth, it is not necessary to wear a denture… This patient was averse to the term denture itself as he felt humiliated that at his age he had to wear dentures interim to the stage after removal of teeth. He wanted a permanent alternative. 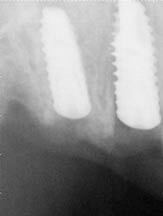 In such cases, as a bridge takes more chewing load, it will require greater number of implants to take that loading. Here the minimum required i.e. ; 6 implants were placed in the upper and 6 months later the process of fabricating prosthesis was initiated after x ray evaluation. To evaluate bone quality and anatomy a special 3-D CBCT scan was used which also detected an anatomical anomaly of the mandibular nerve. Severe Bone loss This Young 27 year old patient with history of an accident when she was 15 years old was missing the entire right arch. Her history further revealed that she was wearing dentures for the past 12 years which had completely eaten away the bone there. Most places she had been to were not giving her the alternative of an implant as it was a complicated long term treatment and the ones that did were out of her completely out of her budget plan. For her firstly, tibia bone graft was planned and under gen. anesthesia, bone was taken from the leg bone and augmented in the maxillary bone region and re-contoured. In 7 months time, x ray revealed that bone was completely adapted and ready to take up implants. 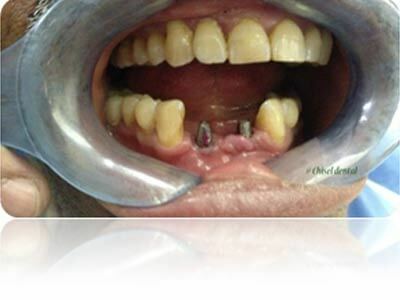 4 implants were then strategically placed and the entire right side arch was rehabilitated over the next 6 months with completely fixed hybrid denture. Elderly Patients [Medically Compromised–Diabetic and Heart disease] Is Implant absolutely contraindicated if you are Diabetic?? Well, absolutely NOT! But yes, if you have uncontrolled high fluctuating Sugar levels, then that needs to be addressed first and any Medical procedure is avoided till then including implants. When Mr. Askiri came to us he had his blood sugar levels on the higher end. He was first counseled on monitoring and trying to regulate his sugar levels in close co-ordination with the clinic as well as his physician and once it was monitored to be under control for 5 months continuously, Implants were placed and allowed to stabilize. Throughout this time period, one needs to be under the physician’s monitoring of sugar levels. 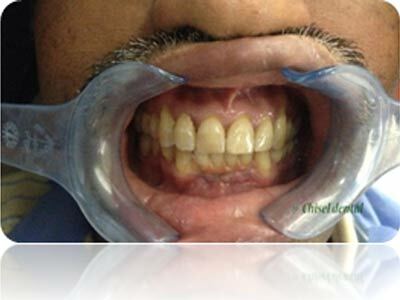 For this interim period of 5 months, a high end valplast flexible partial denture was fabricated which he continued to use post implant placement till the crowns were given. 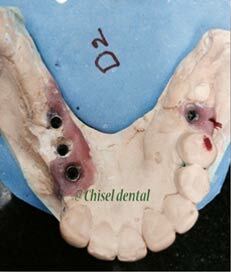 Once stabilized, the abutments and crowns were fixed. Even in patients with certain heart conditions such as valves etc, Implants can be placed successfully when utmost sterilization is maintained and care is taken while prescribing medications. Yes it can. 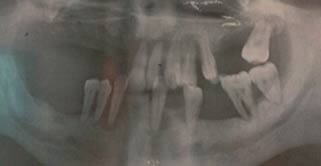 This patient had weak gums with bone loss. Hence first, prior to placing of implants, the gums were treated with laser treatment and gum surgery, followed by implant placement for the upper and then after monitoring the outcome of the upper implants , two more implants were also placed for the lower front teeth. The healing time was almost the same. 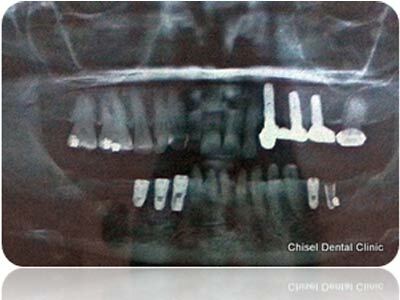 Following implant stabilization, in his case a Hybrid Prosthesis was given which did not transfer the whole load over the implants and also looked extremely natural. 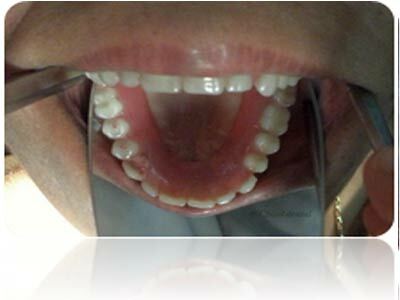 Here, patient is advised to get periodontal evaluation done at least yearly thrice for maintenance. Unlike a few years earlier, presently even patients with resorbed jaw bones can be rehabilitated with implant crowns/bridges or dentures with the advent of Mini implants designed for this very purpose. 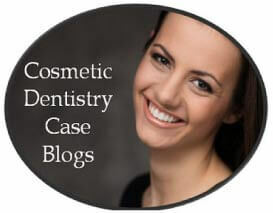 COSMETIC DENTISTRY CASE BLOGS Do you have Spacing between your teeth, missing teeth/ crowding in your front teeth/excessive gums showing/old bad crowns which you happen to think are the norm???? Read On... this is just for you. . Most people feel they have to just bear and live with such teeth and stop smiling altogether but some proactive people opted for a change that changed their whole lifestyle and upped their achievements and how you say?!. Here are a few cases that cover the spectrum of cosmetic /Aesthetic dentistry that were a challenge even to our team of dental specialists to bring to life the patient's vision for a million dollar smile that could light up their eyes and other's hearts. 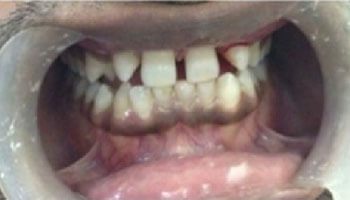 This patient had altogether missing lateral incisors (2 front teeth) from birth and protruding, malpositioned canines and he just came and said “Dr. I want normal teeth, just like the others. something natural looking. I just want a perfect smile. .What do I do?' 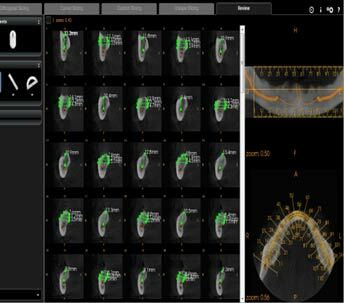 As he was missing to teeth and the adjacent two teeth had partially occupied its space, space distribution was a great challenge We had to digitally design the position of the new crowns to replace the missing teeth. so that we could ensure that the objectives of the patient. 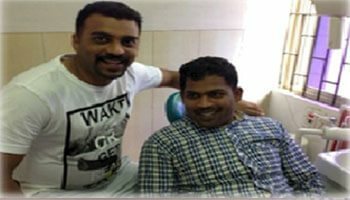 The patient was also co-operative and understood what Dr. Shetty was conveying when he was suggested to go in for a complete smile design from first premolar- premolar as he had a wide smile line instead of the usual canine to canine makeover for the perfect result he was looking for. He was so happy with the trial result itself that no further changes were required. This was a young patient who was perfectly happy with his teeth until an accident chipped of his two front teeth and broke one altogether. 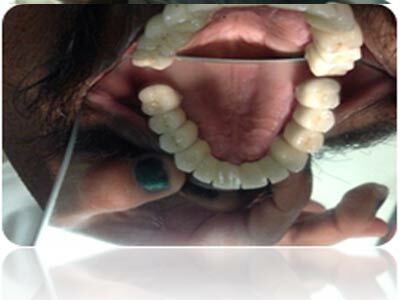 He had been avoiding treatment as he was depressed thinking of bulky artificial crowns most had and thought he would rather have these teeth instead! After being made aware of the latest metal-free ceramic and Zirconia crowns he was ready to go for the treatment but did not want to correct the slight protrusion of the adjacent tooth and intact wanted the 3 new teeth to blend naturally. Here the challenge was to match the shade exactly to that of the existing teeth as we were going for just 3 teeth and to make it look natural rather than the ideal alignment of teeth that is usually done On slightly increasing the translucency after looking at the first trial the patient was very happy with the results. This young patient forever knew she had fluorosis and that she was having multiple decay and chipping off of teeth due to this problem. She had already undergone multiple root canals and crowning of teeth at different times in her life She had come for a permanent solution and wanted to improve her smile at the same time as she had just begun her career. In her case a thorough analysis was done using models and according to her budget a plan was worked out to correct her posterior teeth using (the latest Laser-sintered) metal ceramic crowns and since the gums were thin against her front teeth. metal free crowns were selected for the front four teeth so that they would last long without affecting the gums adversely. We were happy to manage to get her bite perfectly comfortable with her back teeth and her front teeth also corrected to her satisfaction within a weeks' time. This patient had a large space between the front two teeth of more than 2-3 mm which is seen in normal diastema cases and had come with a time frame of 2 weeks to her engagement to have it corrected! 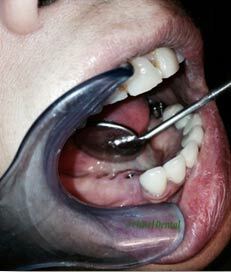 *photographic and model examination put it at almost 5-6 mm and she had come with the intention of getting it closed by altering only the front to teeth and did not want to touch the other teeth. 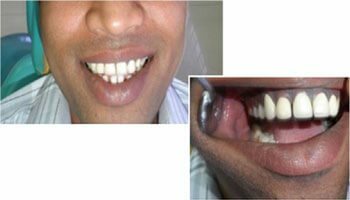 It was a challenge to convince the patient that two teeth if used to close such huge gap would not give the desired esthetic results and in her case a minimum of four teeth would be required to equally proportion them. On the third day,at the trial,she confided happily that this was exactly what was in her thoughts and the work was cemented. This patient has already got crowns to make her teeth look better but she was still conscious and unhappy with her smile altogether though she got the best available crowns and she thought nothing could be done about it now. In a free smile-makeover consultation for her she was made aware that firstly there were much superior materials for crowning front teeth and in her case gum recontouring followed by smile designing with flatter rectangular teeth would be required for a pleasant result and that all her problem areas with her smile could be corrected in about two- three weeks' time if she desired and told her to research about the information we had given her A week later she suggested she would like to go ahead with her smile makeover and had already kept her calendar free for the coming two weeks. 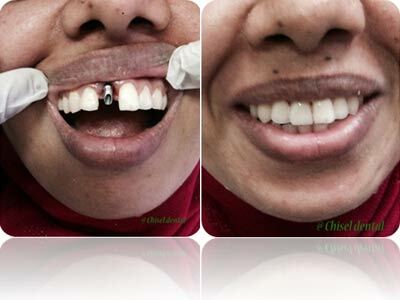 This was a wonderful case in itself because we could meet the patient's expectations and the dramatic changes seen not only in her teeth but her body language and the way she smiled itself. *firstly. Laser gum recontouring of her first 6 teeth was done and the old crowns were removed artistically reshaping her teeth for the new crowns: all in the first sitting itself under anesthesia. 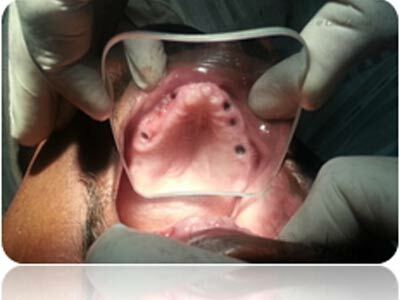 Then we placed temporary teeth leaving it for 10 days for gums to start healing. The impressions for the permanent crowning were taken at the 14th day and by the 18th day she had a bright smile in place that she said she never thought feasible. 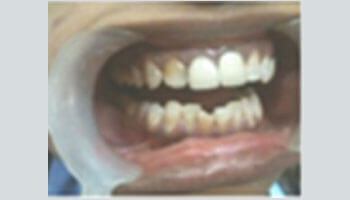 This girl had a narrow arch alignment of teeth which resulted in two front teeth being so protruded that she was finding it difficult to close her lips and her mother complained that she never smiled and felt shy to even speak to people because of this problem As her wedding was due she did not have the time for correction using braces. Her budget did not permit her to go for a complete smile design and she requested if we could just correct this in the best possible manner. This patient Mr.Hajee had come to our set up months ago stating he had undergone crowns treatment and in fact got a picture from a magazine asking why his teeth are looking ugly while it's so wonderful in this picture! 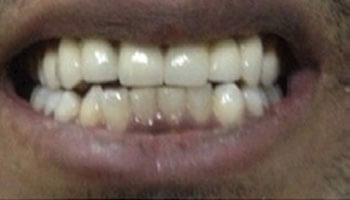 He said he hadchipped off his four front teeth and he went to a nearby dentist who helped him get metal-fused porcelain crowns for the maxillary anterior teeth spanning from right canine to left canine He was really disappointed with the esthetics of the metallic tinge that it gave to his smile. He was embarrassed to smile in front of anyone. The classic solution to address the issue was to replace the 6 unit metal-fused porcelain crowns with highly esthetic Metal-free crowns.Due to its excellent biocompatibility, high esthetic value and very high strength, we have an immediate excellent cosmetic and functional post-operative result. This is important because. 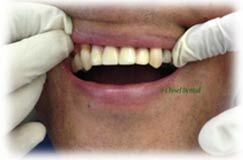 on one hand the patient’s cosmetic expectations should be addressed and on the other hand, neighboring tooth should not be affected and also should allow him to maintain his oral hygiene "
In his case there were two main challenges. 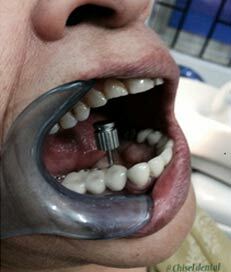 The "first was the careful removal of existing prosthesis without damaging the tooth inside. the second consisted of aligning the remaining tooth structure, which is the most important step, to impart the best esthetic results. He also required a round of deep cleaning of the gums to make it receptive to the new crowns. Hajee! now has permanent high value biocompatible aesthetic e-max crowns, which in principle are no different than natural teeth in regards to function and appearance and if well cared for, will last for decades. 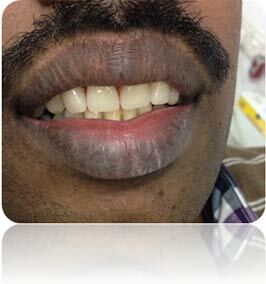 In a similar case, this patient had what he knew to be tetracycline stains on all of his teeth and wanted to get it corrected. He already had a perfect alignment of the teeth. The challenges we managed to overcome in this case were to preserve the tooth structure by going in for porcelain veneers (laminates) and at the same time mask the discoloration completely so that it would not show through the thin Veneers. Thus, we could meet t he very high expectations of the patient who did not mind the expenditure as long as he could get the best that was there. 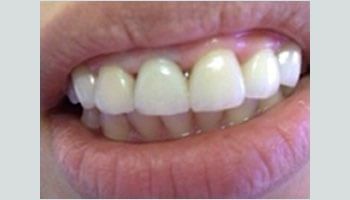 A Similar patient with discolored naturally yellow teeth had undergone bleaching multiple times and wanted a permanent solution She was advised for porcelain lumineers to get the best results.She was happy with the resultant bright smile at minimal shaping of tooth structure. 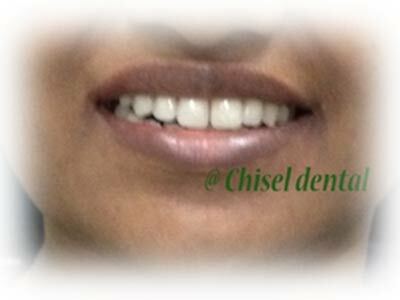 Case1: This professor in an established institute had come to us looking for a cosmetic and functional makeover at once so that she could have her teeth looking as they did 15 years ago when she was younger. 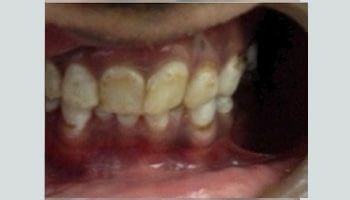 She desired "natural looking set of pleasant teeth" to replace the present ones that had multiple composite fillings, and also her missing posterior teeth. At her trial she felt as she would like a brighter shade and was happy with the rest. It was a small matter of within a day that the color was changed as per her wish and she felt satisfied with the final results. 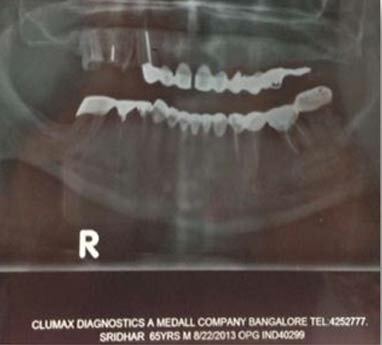 Case2:In a similar case,this patient had not bothered to replace his missing back teeth since a long time and been using his front teeth for chewing that had resulted in collapse of the bite with severely attrited / worn out front teeth. 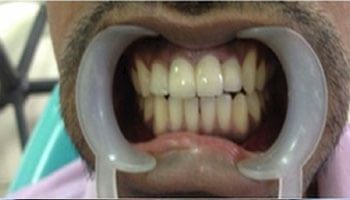 He was explained about the importance of the posterior teeth for overall hygiene maintenance and first posterior teeth were replaced to raise his bite and alongside the anterior teeth were restored to their past glory. 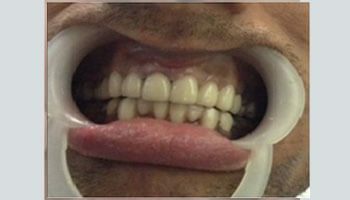 In this case the patient had quite a bit of crowding of her front 6 teeth, and had come with her fiancée for a Cosmetic solution to having a great smile before her wedding due in four months. So,braces as an option that was given to her. she was unwilling to accept. 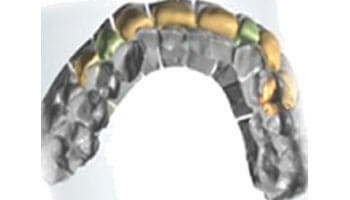 The Accomplishments in her case was to give a perfect alignment within a smile line front six teeth itself, without making it look protruding and to make it look natural so that she loses her inhibition of smiling, She was happy she went in for high end Zirconia crowns as she realized it was an investment she would cherish for life.